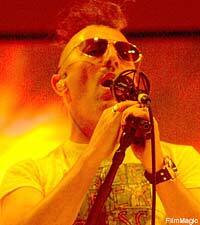 "Absolutely not" was Maynard James Keenan's answer when asked if he wanted to discuss Tool. Keenan has always kept Tool close to the vest, and today was no different. However, the vocalist was seen walking with crutches at a recent Tool show in California, despite the absence of broken bones. "I had an extreme leg cramp and couldn't walk, so the crutches helped," Keenan told Noisecreep. With Tool, A Perfect Circle and Puscifer, Keenan has established himself as a unique artist with unusual mystique in rock music, both above ground and below. No matter how well his bands do commercially, his vision and his goals don't waver -- nor do they become clouded. He's a kindred spirit to Mike Patton, who continues to do his own thing and seek artistic and aesthetic fulfillment, regardless of his past. "I do what feels right and am not locked into any kind of contract," Keenan said. "Our goals, in general, whether it's A Perfect Circle, Tool, winemaking or Puscifer, have nothing to do with the goals that more corporate, manufactured bands have and our goals are not the same as that show ... what's it called? Where you compete to be the best singer?" He's referencing 'American Idol,' a show which he has some disdain for, conceptually speaking. He continued, "I am not up on that show. But I have different goals than those people. We're not trying to be the most homogenized, safe or an accessible project. We're just doing a job as artists to observe, interpret and report, which are not the basic goals set up for more of the mainstream ... I don't want to call them artists. Maybe they're products? That may be what they want to be in their hearts, but the goals are different. "The job, and what I interpret as my job, if that's how you want to label it, is to observe, interpret and report. We march to the beat of that drummer, so the results are different and decisions are different, since they have nothing to do with money or fame."